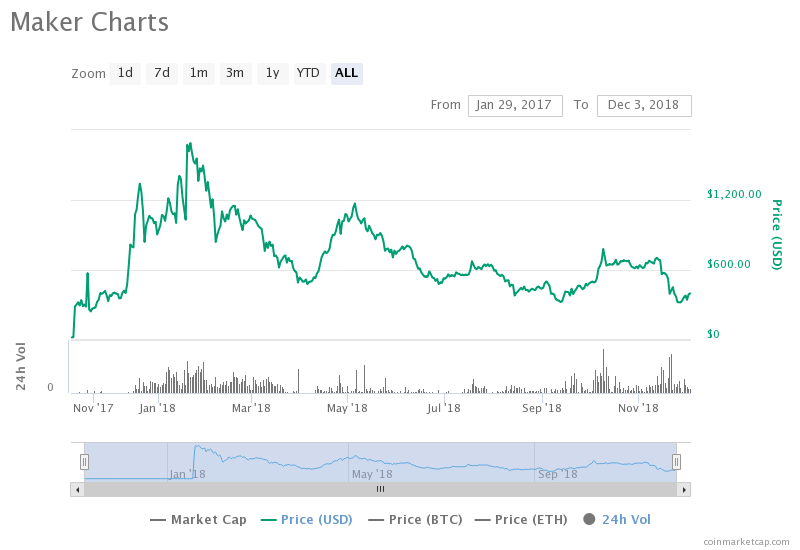 The contraction of the cryptocurrency market that happened in the past weeks (months even) has confirmed that stablecoins are a needed instrument in it. During the period since beginning of September to the end of November, the total market capitalization of the cryptocurrency market was close to halved and it was indeed only the stablecoins that managed to keep their price at expected/targeted levels. After the overview of fiat-backed (in part 1) and commodity-backed (in part 2) stablecoins, the focus can shift from centralized stablecoin designs that are to great extent based on trust, to decentralized designs — which don’t rely on third party audits and regulation, and are realized fully on-chain. In a highly convergent market, such as the market of crypocurrencies, one might wonder why would one cryptocurrency be used as a collateral that stabilizes the price of an another cryptocurrency, when it’s clear that the entire market moves whenever Bitcoin price moves and almost all cryptocurrencies move in the same direction. In the simplistic approach, analogous to the design of fiat and commodity backed stablecoins, this approach would clearly be non-sense. However, with a somewhat more complex design, there are cryptocurrencies maintaining low price volatility backed by other cryptocurrencies. 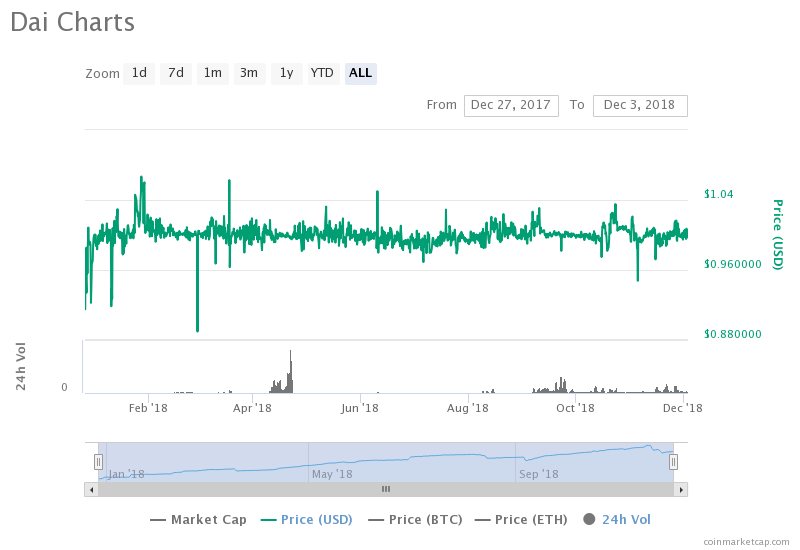 The DAI is a cryptocurrency backed stablecoin issued on the Maker DAO platform. The value of DAI is pegged to the US dollar, in a manner that 1 DAI should at all times have the value equal to 1 USD. The issuance, price stability and supply control of the DAI are achieved using several other instruments, operated by the DAO. The DAI is issued by depositing the collateral (pooled ETH) into a smart contract called CDP (Collateralized Debt Position) in accordance with the liquidation ratio of the CDP — which is 150%, meaning that the value of the ETH collateral has to be minimum 150% of the value of the issued DAI. After locking up the collateral, the proprietary amount of 1 USD valued DAI is issued and the holder can use it to trade, pay for goods and services. The stability of the price of DAI is market driven and realized by modifying the incentives to create DAI — if the price falls below the targeted 1 USD, the cost of creating new DAI increases, while in the case the targeted price is exceeded, the cost of creating DAI reduces. These incentives control the supply of DAI. As the DAI trading information shows, thus far this concept works fairly successfully — the lowest price of the DAI was on the 11th of January 2018–0.720637 USD and the highest on the 18th of March, 2018–1.11 USD. The locked collateral is released from the CDP by returning the outstanding debt i.e. by depositing the DAI back to the platform. As the DAI and its’ collateral “live” on the blockchain, there are no third party regulators and auditors involved in ensuring that the outstanding DAI is collateralized in accordance with the minimum liquidation ratio. For this purpose, the authors of the Maker DAO have created a governance token Maker (MKR). The MKR, however, is not a stablecoin and is not collateralized like the DAI. Holders of MKR are incentivized by collecting fees from the governing of the platform. They support the price of DAI by liquidating open CDP position in cases when the value of the locked collateral becomes insufficient in regards to the liquidation ratio. Applications called “Keepers” are used to seek risky CDP positions — those where the DAI to collateral ratio is close to the liquidation ratio. The aspects of stablecoins design noted as significant in the first part of this series — decentralization and cost of the price stability with cryptocurrency backed stablecoins are quite different compared to centralized stablecoins backed by fiat and commodities. Clearly, they are decentralized, running on the blockchain (in smart contracts) without human intervention or control, and as such considerably closer to the values of decentralization and trustlessness promoted by the cryptocurrency sphere. The cost of achieving the stability of the price is, though, considerably higher than with fiat and commodity backed stablecoins. While with e.g. the USD Tether for each USDT in circulation there is 1 USD deposited as collateral (or so we should think), the minimal locked collateral value for each DAI is 1,5 USD. Due to the frequent and rapid changes of the collateral price, holders of DAI tend to deposit considerably higher amounts of collateral . 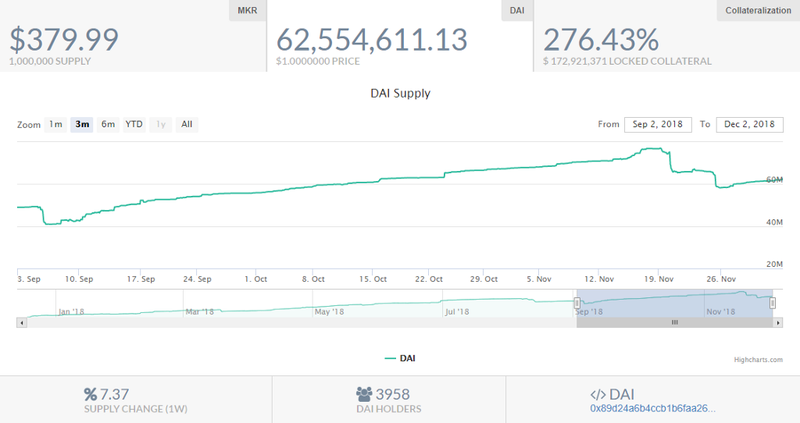 As the image above, taken from the Maker tools health monitor, shows, the supply of 62,5 mil DAI is collateralized by 172,92 mil USD worth of pooled ETH — for each DAI, there is 2.76 USD of locked collateral. On top of this cost, holders of DAI pay a governance fee of 2.5% annually and in case of collateral liquidation a fee of 13% — the cost of decentralized and trustless price stability — one might say. The views expressed in this article are not investment advice nor recommendations. The facts contained herein are not necessarily complete and readers of this article should do their own due diligence, including seeking independent financial advice, before investing. This article is not an offer, nor the solicitation of an offer, to buy or sell any of the assets mentioned herein. The text of the article is available on the Burst blockchain, and is retrievable using the CLOUD-REV8-R7KQ-PSWK-D9Q2V CloudBurst ID. Crypto Backed Crypto: Stablecoins (Part 3) was originally published in Data Driven Investor on Medium, where people are continuing the conversation by highlighting and responding to this story.